Former President Trump's former rival, Jeb Bush, has called a Republican candidate to challenge the president in the 2020 GOP nomination, as the party "should have a choice." "I think someone should come in. Just because Republicans should have a choice," Bush said in an interview with former Obama advisor, David Axelrod, airing Saturday on CNN. 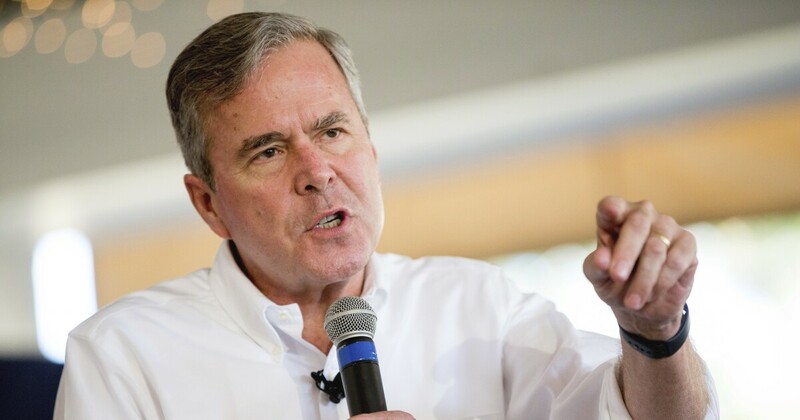 Bush, who served as Florida's governor from 1999 to 2007, acknowledged that the chances of a Republican opponent to beat Trump in 2020 would be a difficult climb because "his base is strong and loyal"
"It's hard to beat a president in office," he said. "But it's important to have a conversation about what it's like to be conservative." Bush made the comments while discussing the Republican governor of Maryland, Larry Hogan, a potential challenger for Trump, according to CNN. Hogan will travel to New Hampshire in late April. The state is a must for presidential candidates because it holds the first primary of the country. A poll released earlier this week revealed that 41% of Republicans enrolled in Iowa wanted a member of their party to run against Trump. Last month, former Massachusetts governor Bill Weld said he had formed an exploratory committee to study the possibility of standing against Trump as a Republican. Weld was the vice-presidential candidate of Gary Johnson, presidential candidate of the Libertarian Party, in 2016. Trump Fed's choice, Stephen Moore, claims a report from CNN and other media: "Shoot a Kavanaugh against me"